A 2017 graduate of Parson’s School of Design, Moon Choi is a talented, rising designer to watch for at New York Fashion Week. To Choi, fashion is the manifestation of a person’s attitude pertaining to life. She believes clothing is not defined by gender, and her aesthetic blurs the boundaries between masculine and feminine. “I try to not be one-sided and find a balance between feminine and masculine or tension and freedom,” says Choi, “and that gave me a sense of purpose to find freedom in daily life.” The following are some highlights from her collection this year that embody what Choi stands for. 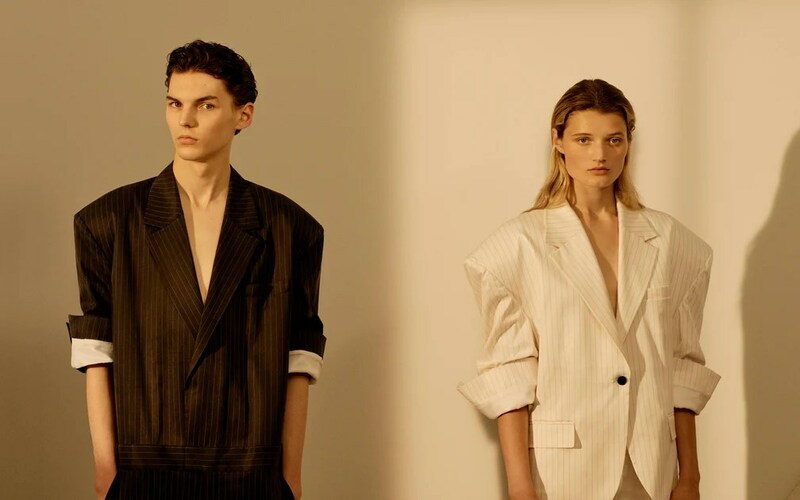 With streetwear on the rise, Choi’s decision to double down on tailoring is a bold move. However, Choi isn’t serving up stuffy suiting but rather playful takes on the classic blazer-trouser combo. Part architectural, part avant-garde, her work “blurs the boundary between gender norms, as it gently shifts the notions of gender and identity,” she says. “It’s the expressive result of how I believe clothing can inﬂuence one’s identity and behaviour.” This results in odd yet captivating reinterpretations of classic garments. Moon Choi was first drawn to tailoring—the typically masculine realm of suits— as a kid watching her father, a businessman, dress for the office. “Every time he left the house, he would come out in a clean suit,” she says. “I started to look at how the clothes formed his identity and attitude.” Working with that idea in mind, Choi tries to upend expectations and “blur the boundaries between masculine and feminine” through her work. Choi developed and incorporated dyed organza into her line, and plans to make her signature. Appearing in gentle hues of lavender and turmeric, the organza was made from natural fabrics and are styled slightly wrinkled as though it was slept on.